Guess what?! 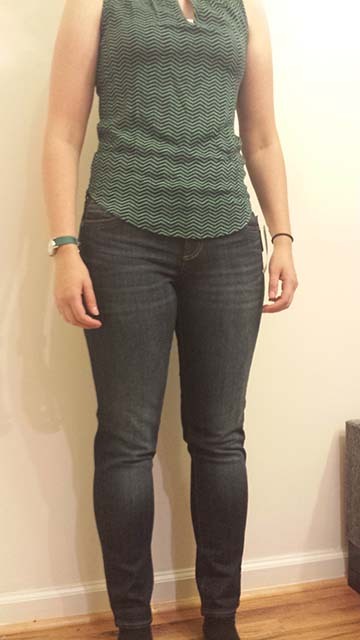 I got my third Stitch Fix this week! What is a stitch fix? Basically, you go to their website, fill out your style profile < (which was super detailed! ), pay $20, and they mail you a box of clothes, usually 5 items. You can chose to have accessories sent too, but I opted out of those, for now. < You don’t have to do any work. Besides get them out of your mailbox. And try them on – but that’s even in the comfort of your own home! After you try them on you have three days to decide if you want to keep them. If you keep them, you go online and pay for them. If you do decide to keep anything your $20 styling fee goes towards the purchase. If you don’t keep anything, you only lose the 20 dollars you paid to have them style for you. AND < If you keep everything you get 25% off. That’s the down and dirty basic steps. You can learn SO much more by going to their website. When I first put these on I was in love with them. They were an awesome fit. 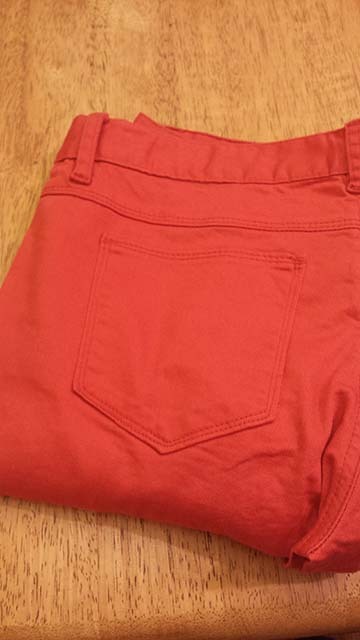 I currently don’t own any skinny jeans, and was excited to see these in my box. I wore them around the house for a few hours. After wearing them for a bit, I changed into my old jeans (that I thought I was looking to replace), and realized that I liked them just as much. As much as I liked these, I had a hard time justifying paying $78 for jeans that I wasn’t super sure I needed. So…they went back. I was excited to try a colored jean. But, alas, I couldn’t get these on my legs. Like. Couldn’t pull them over my calves. Ohh leg muscles. 🙂 Needless to say, they went back. I was torn when I first saw this shirt. 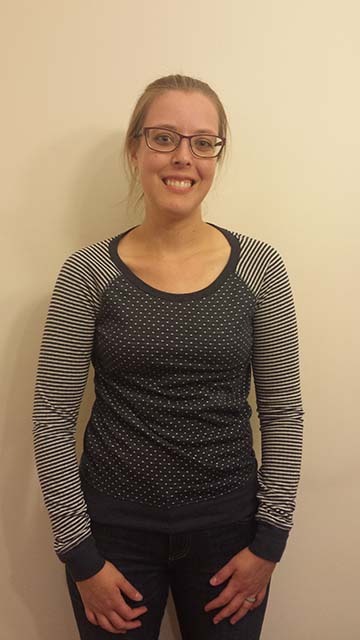 It was super soft and felt really cozy…but I wasn’t totally sure how I felt about the stripes and the polka dots together. 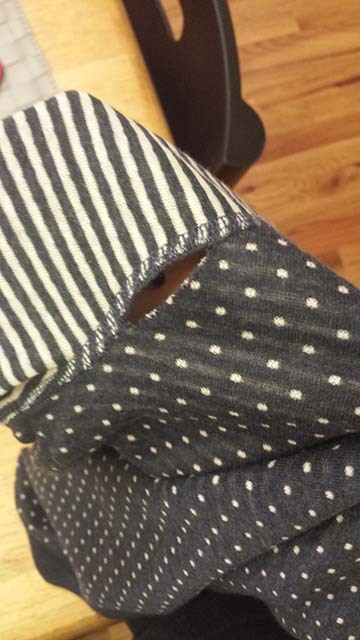 Luckily, the decision was made for me … because as I was trying it on I noticed there was a hole in the sleeve seam. In the Vlog above you’ll see that this shirt fit nicely and I really did like the way it looked and felt! My only concern was that the sides (which are cut higher than the front and back – and I like that) are cut really high up – and if I moved at all it showed my stomach. This would have been a no-go for work, so, unfortunately – this one went back. 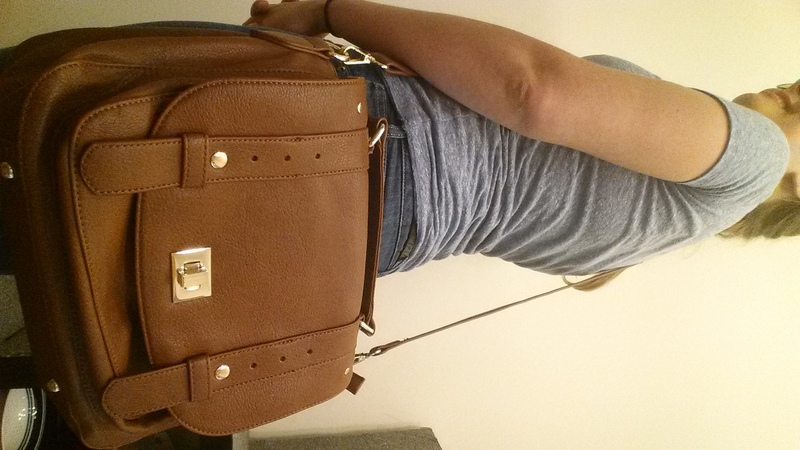 So glad that you decided to keep the messenger bag! It looks beautiful for fall outfits 🙂 I just checked out Stitch Fix’s website and I think I’m going to sign up soon! I’m still deciding between it and other services like Birchbox, Vain Pursuits and Ipsy Bags. What do you think? Hey Crystal! Thanks for stopping by! I do love the bag and am so glad I kept it!! I haven’t tried any of those other subscription services – but I have watched friends to box openings of Birchbox (it was underwhelming) and Ipsy bag (it’s cool! But I don’t do much makeup-y stuff so it’s not for me). 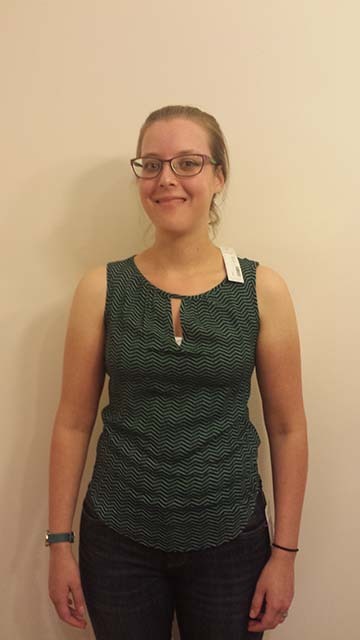 I have been really satisfied with StitchFix! Sounds great! I can’t wait to hear how you like it! 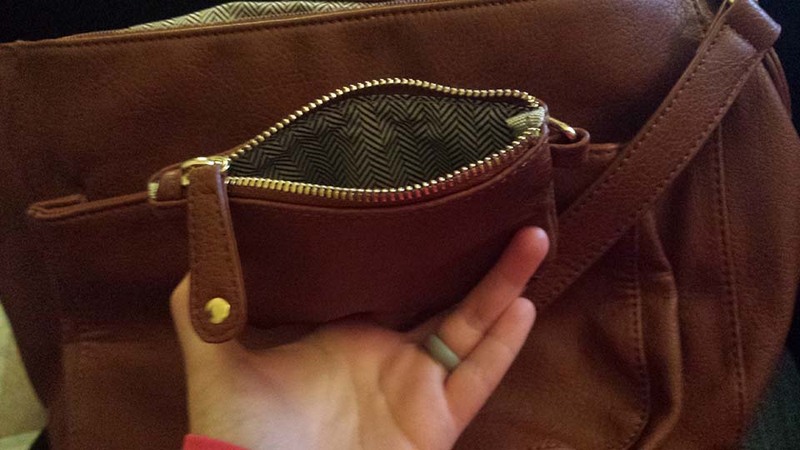 Thank you for pointing out the very obvious (but apparently not to me) solution for this messenger bag – I just got it in my latest Stitch Fix box and I was having the same issue. 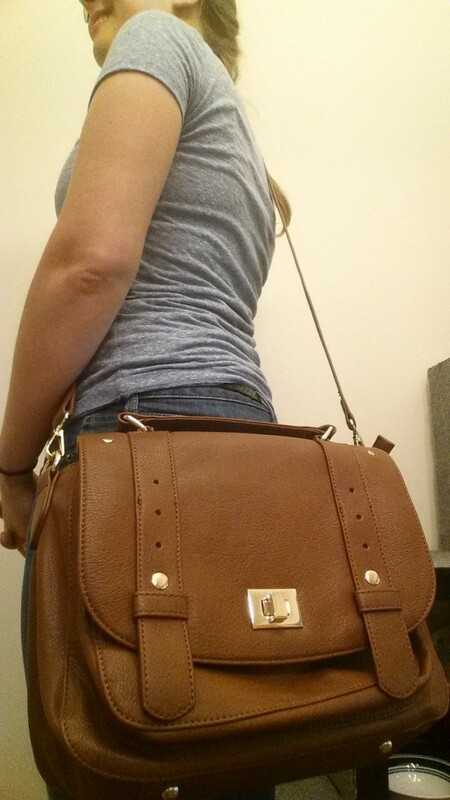 I like it, it looks great, but the strap is WAY too long (apparently they make bags for 6 ft tall people and above. ahem, not me). You have have cemented my decision to keep the bag and get another hole punched in the right place!